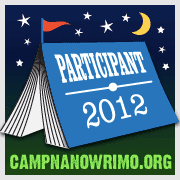 The June session of Camp NaNoWriMo is almost at a close and as I look back on what I have achieved I have a not quite met the NaNo 50K goal. I'm short by, oh 40K words give or take a hundred. I am not wallowing, though. I've actually made some good progress. The outline is there, so yay me. 50K words was just not in the cards this month. And I'm all right with that. I'll keep going and be there for August's camp. I think even the characters in a good work of fiction usually have a valid reason to hate their creators. Who wants to read about people who live sunshiny lives where nothing ever happens? The crap has to hit the fan. Repeatedly. What would your characters say about you? Group therapy would NOT be fun with my dudes. One got kidnapped and dumped in a well. Another is one of the last few survivors of an awful war. A third isn't even a real boy.